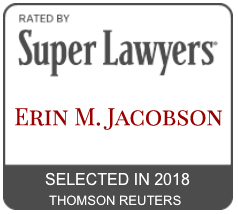 Disclaimer - Erin M. Jacobson, Esq. The information contained on this web site and any linked resource is intended to provide general information and does not constitute legal advice. The content is not guaranteed to be correct, complete, or up-to-date. This web site is not intended to create an attorney-client relationship between you and Erin M. Jacobson, Esq., her entities, offices or any of her associates, and you should not act or rely on any information in this web site without seeking the advice of an attorney. In reading the articles posted on this web site please note that the information provided is not a substitute for consulting with an experienced attorney and receiving counsel based on the facts and circumstances of a particular transaction. Many of the legal principles mentioned are subject to exceptions and qualifications which may not be noted. Furthermore, case law and statutes are subject to revision and may not apply in every state. Because of the quick pace of technological change, some of the information in these articles may be outdated by the time you read it. Readers should be aware that business practices, distribution methods and legislation will continue to evolve in the rapidly changing multimedia and entertainment industries. THE INFORMATION IS PROVIDED “AS IS” AND ERIN M. JACOBSON, ESQ. AND HER ENTITIES, OFFICES AND ASSOCIATES MAKE NO EXPRESS OR IMPLIED REPRESENTATIONS OR WARRANTIES, INCLUDING WARRANTIES OF PERFORMANCE, MERCHANTABILITY, AND FITNESS FOR A PARTICULAR PURPOSE, REGARDING THIS INFORMATION. NO GUARANTEE IS GIVEN OR MADE AS TO THE COMPLETENESS, ACCURACY OR TIMELINESS OF THIS INFORMATION. YOUR USE OF THIS INFORMATION IS AT YOUR OWN RISK. YOU ASSUME FULL RESPONSIBILITY AND RISK OF LOSS RESULTING FROM THE USE OF THIS INFORMATION. ERIN M. JACOBSON, ESQ. AND HER ENTITIES, OFFICES AND ASSOCIATES WILL NOT BE LIABLE FOR ANY DIRECT, SPECIAL, INDIRECT, INCIDENTAL, CONSEQUENTIAL OR PUNITIVE DAMAGES OR ANY OTHER DAMAGES WHATSOEVER, WHETHER IN AN ACTION BASED UPON A STATUTE, CONTRACT, TORT (INCLUDING, WITHOUT LIMITATION NEGLIGENCE) OR OTHERWISE, RELATING TO THE USE OF THIS INFORMATION.